I don't remember the exact date I personally heard Pearl Jam the first time. It was probably March or April of 1992. It was the MTV Unplugged version of "Alive ". At least that's when I first noticed. I may have seen the official video for it prior. I can't remember everything. But the Unplugged version is what caught my attention. I remembered wanting to watch it again. I tried to remember the chorus so I'll know when it came back on again. But for some reason it didn't show again. And I watched MTV a lot back then. I just, I guess kept missing it. It was frustrating. But eventually I saw the actual video. It confirmed that I still liked the song. Even Flow was their next music video and like most people. I was fan of the song. I wasn't buying cds or cassettes much at that time. Because I didn't have the money. So I didn't rush out to get their debut album "Ten ". I just knew those two songs. I waited to see the whole Unplugged show. But MTV were being dicks and didn't air it enough after the initial airing. Now some people might say. "I've seen it on MTV plenty of times". Well I didn't. I'd check the TV Guide. Stayed up all night. Nothing. They would show clips like the previously mentioned "Alive". But the full show I would have to wait to buy a bootleg copy of it. But the unedited version with the time stamp at the bottom of the screen. I think that's what that's called. Some time later on a Saturday, I'm visiting my sister at her new apartment. And one of her roommates had the Ten cd. We start listening to it. I was instantly hooked. Eddie Vedder's vocals just gets your attention. I probably should have mentioned that earlier. But I'm not writing 50 drafts. Anyway, we get to the song "Black". Now I need to get this album. I want to say she let me keep it. But I honestly don't remember. I eventually got the cassette. 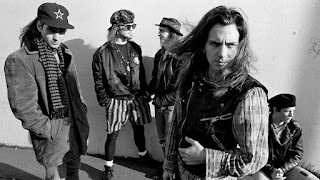 After watching their performance of Animal and Rockin' in the Free World with Neil Young at the 1992 MTV Music Awards. Buying their next album Vs. was a must. And again it did not disappoint. I considered myself a fan by this time. I couldn't say they were going to be my number one band. But they were up there. Next came "Vitalogy ". MTV News played a snippet of "Spin the Black Circle" I really couldn't make it out. So I couldn't say whether or not I liked it. But I was worried I might not. That aside I got it when the cd was released. The vinyl version was released 2 weeks prior. Again, I couldn't get enough of this album. They could do no wrong. Now I'm looking through the P section in record stores hoping something new from Pearl Jam would pop up. Then came Merkin Ball . A 2 song EP that was a companion to Mirror Ball. A Neil Young album done with the members of Pearl Jam sans Eddie as his backing band. The 2 songs, "I Got Id and "Long Road". After hearing "I Got Id" that was the moment where there was no turning back for me. They were going to be my all time number one band. I'm not going to go through every album or official bootleg. Just know I love them all. I never got to see Pearl Jam live in the 90's. My first show was August 23, 2000 at Jones Beach in Wantaugh, NY. As a member of the Ten Club, my seats were pretty good. It was raining that day. So the pictures I took with my disposable camera were ruined. But the show was great. And whatever I might have forgotten about the show. I can go back to the live bootlegs or Youtube videos of the show. Another plus of being a fan of Pearl Jam. Is the fan community. We've gone through many names. Jamily, Jammers, or the Faithfull (extra L because that's how it was spelled on Yield) I've met many great people throughout the years. Now that if you don't have tickets to a show. You still go to pre-parties just to hang with the people. And If you decide last minute you want to go the show. Someone there will hook you up with a ticket. This is just a quick story of me becoming a Pearl Jam fan. I could have gone into more detail about certain things. But I didn't. I love Pearl Jam. That's all you need to know.